My children have always loved curries. But then I've usually made them from scratch, using whatever I have in the cupboards and in the fridge 30 minutes before dinner time. Whenever I've tried to buy a shop-bought jar of sauce, it's always that it's too spicy, too mild, too sweet, too salty, etc. So I kind of gave up on the stuff from the shops. 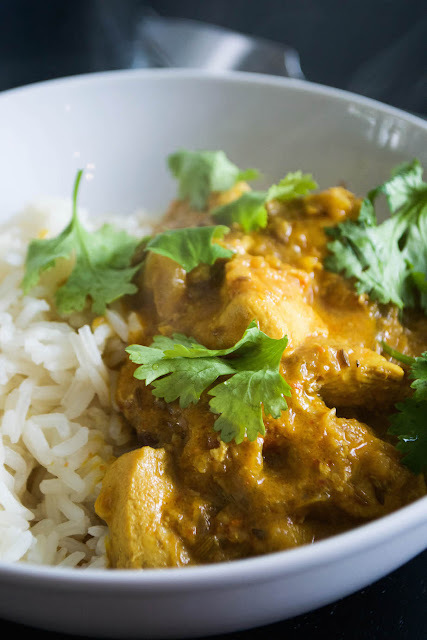 Making a curry isn't difficult, anyway. You just fry up some aromatics and then dump in the meat or vegetables, some liquid and let it simmer until it's all cooked. And you have total control over what goes in there. 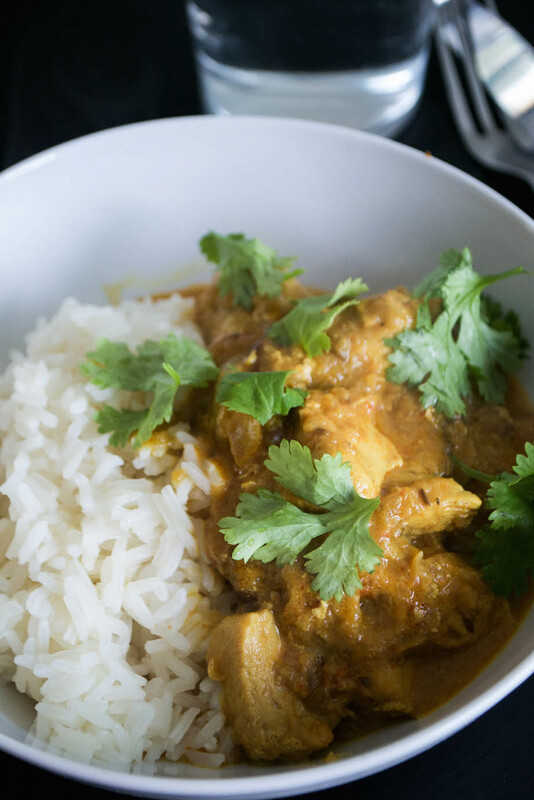 This chicken curry is one of my kids' favourites. There's no spice - although you could always add a little chilli powder if you want to. Instead, there's earthy turmeric, sweet cinnamon, aniseedy fennel seeds and aromatic cardamom. I've used butter, but other than that, it's also dairy free, so it's good for little tums if you're watching that. If you don't want to use butter, just use some extra coconut oil. I love that this takes about half an hour to make - so it's fine for mid-week meals and you can have the house smelling beautiful just a few minutes after you're back in from the school run. Chop coriander if you like (I love coriander, my children don't) and scatter it all over just before serving. This curry is gluten-free and paleo but not AIP because of the seed and nightshade spices and the tomato paste. Use coconut oil instead of butter and it's dairy-free. Rice isn't paleo, but I do eat it a little bit. First, heat the coconut oil in a large frying pan and chop the chicken into bite-sized chunks. Brown the chicken until almost cooked and then lift out onto a plate. Next, quickly blitz the garlic and onion into paste using a food processor and heat the butter in the pan. Fry the onion and garlic paste until aromatic and soft and then stir in the spices. Add the chicken back into the pan, along with any juices that have collected, and then pour in the chicken stock. Finally, stir in the coconut sugar and tomato purée. Leave to simmer for about 10 minutes until the chicken is fully cooked through. Once everything's cooked, stir in the coconut yoghurt and season with a pinch of salt. Serve hot, straight away.